The Hellenic Parliament (Greek: Βουλή των Ελλήνων; transliterated Vouli (also Boule) ton Ellinon) is the Parliament of Greece, located in the Parliament House (Old Royal Palace), overlooking Syntagma Square in Athens, Greece. It is a unicameral legislature of 300 members, elected for a four-year term. During 1844-1863 and 1927-1935 the parliament was bicameral with an upper house, the Senate and a lower house, which retained the name Vouli. Although during the Greek Revolution a number of National Assemblies had been held, the first national parliament of the independent Greek state was established only in 1843, after the September 3rd Revolution, which forced King Otto to grant a constitution. In 1911, a revision of the constitution resulted in stronger human rights, the reinforcement of the Rule of Law and the modernization of institutions, among them the parliament. After seven years of military dictatorship, on 8 December 1974, a referendum was conducted to decide about the nature of the form of government. By a majority of 69.18%, the Greeks decided against a constitutional monarchy and for a parliamentary republic. The Greek Parliament (Vouli ton Ellinon) has 300 members, elected for a four-year term by a system of 'reinforced' proportional representation in 56 constituencies, 48 of which are multi-seat and 8 single-seat. Seats are determined by constituency voting, and voters may select the candidate or candidates of their choice by marking their name on the party ballot. However, the party receiving the largest number of votes receives 40-seat premium, which is filled by candidates of that party not declared elected on the lower rungs (the constituencies). Eligible for deputies are Greek citizens aged 18 or over on the date of the election, who are eligible to vote. With the sole exception of university professors, citizens who are public servants are disqualified from submitting their candidacies, unless they irrevocably resign their office before promulgation. 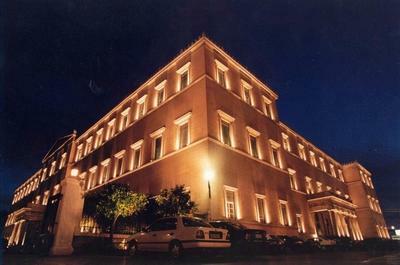 The business of parliament is handled by the Presidium (Προεδρείο της Βουλής), which consists of the Speaker, five Deputy Speakers, three Deans and six Secretaries. It is characterised by a tri-partisan composition, meaning that the fourth Deputy Speaker, a dean and a secretary belong to main opposition party, and the fifth Deputy Speaker and a secretary belong to the next largest (by seats) opposition party. A member of the Presidium, who of course must be a parliamentarian, cannot be a member of the Cabinet or an Under-Secretary. While the Speaker of the Parliament and the five Deputy Speakers are elected at the beginning of each term and for the entire duration of that term, the tenure of the Deans and of the Secretaries lasts for the duration of one regular session of the Parliament for which they were elected. The swearing-in ceremony of the new members of the Hellenic Parliament in October 2009. The Parliament votes for a Bill (Νομοσχέδιο, Nomoskhedio) to become Law (Νόμος, Nomos) in three voting sessions: firstly in principle, then per article (when amendments may be proposed and either approved or rejected) and then as a whole. A "simple" (50% plus one) majority is sufficient for any such vote to pass. Once the bill is passed, it is sent to the President of the Republic to promulgate and publish in the Government Gazette. The countersignature of the appropriate government minister(s) is required. Delegation of legislative power is generally allowed, unless the Constitution provides for a situation where a Law (Nomos) is required. Laws can be found online in the National Gazette but the service works through subscription. Also, hard copies of the legislation can be obtained at the National Gazette office for a nominal fee. A private online service, the Nomos database, that again works through subscription, can be used for legislation research. There is no public database or website where one can obtain legislation. It is not published in the Parliament website either. Parliament has the right to revise or amend the Constitution, except for the articles dealing with the "Form of the State" (i.e. the establishment of the presidential, parliamentary republic) and the articles safeguarding human rights and freedoms, which are unalterable. Revision of the Constitution is initiated by a motion by at least one sixth of MPs, and agreed by a supermajority of three fifths of MPs, expressed twice, in two separate votes at least one month apart. In this case, the business of revision is transferred to the next term of Parliament, i.e. after the following legislative elections. Parliament may then ratify the revision by a 50% plus one majority. If the initial motion for revision has only achieved a 50% plus one majority, then a three fifths supermajority of the new Parliament is required. A Parliament thus endowed by its predecessor with the powers of revising the Constitution is officially named a "Revisional Parliament" and is enumerated separately from "Ordinary" Parliamentary terms. In recent years, the 1974 Parliament was titled "5th Revisional", the 1986 one was the "6th Revisional" and the 2001 one the "7th Revisional Parliament". The 2004-2007 Parliament was the "11th Ordinary Parliament" of the Third Hellenic Republic, and the 2007 Parliament will be the "8th Revisional Parliament". A minimum of five years must elapse after the successful conclusion of the revision process, before another may be initiated. During summer recess, Parliament operates "Teenager Parliament" (Vouli ton Efivon), a series of sessions during which a rotating quota of MPs attends speeches and debates held by high school junior students from Greece, Cyprus, and the Greek Diaspora. The program carries the twin aims of alerting parliamentarians to the needs and perspectives of younger generations, and to educate teenagers in the practice of proper debating and participation in public life. Parliament also hosts official visits and tours for middle- and high-schools throughout the school year. Parliament administers the "Parliament Foundation", a research and publishing foundation established to produce printed and electronic media, mainly on archival material, historical and scientific matters pertaining to parliamentary functions and the past political and cultural life of Greece. Parliament was housed in the Old Parliament House, on Stadiou Street, from 1843 to 1854 and again from 1875 to 1932. The current building, a neoclassical three-floor structure designed by Friedrich von Gärtner and completed in 1843, originally served as a palace for the Greek monarchs. After suffering fire damage in 1909, it entered a long period of renovation. Members of the royal family continued to reside there until 1924, when a referendum abolished the monarchy. The building was then used for many different purposes — functioning as a makeshift hospital and a museum, among other things — until November 1929, when the government decided that the building would instead house the Parliament. After more extensive renovations, the Senate convened in the "Old Palace" (Παλαιά Ανάκτορα) on 2 August 1934, followed by the Fifth National Assembly on 1 July 1935. Although the monarchy was restored that same year, the building has housed the Parliament ever since. The Tomb of the Unknown Soldier (Μνημείο του Αγνώστου Στρατιώτη), guarded by the Evzones of the Presidential Guard, is located in the formal forecourt of the building. Construction of the monument began in 1929 and was inaugurated on March 25, 1932. The main Chamber of Parliament, on the ground floor, is amphitheatrical in layout, and is panelled in purple and purple-veined white marble with inlaid gold ornaments. Seating for the MPs is arranged in five circular sectors. The Speaker's Chair, the lectern, the ministerial and state functionary benches, and the stenographers' vault are made of carved wood and are laid out facing the MP seats. A colonnaded balcony surrounds the upper tier of the Chamber and is used as the visitors' gallery. Part of it served as the Royal Box in the past. A vitrail roof provides natural light during daytime. An almost identical, but smaller-scaled, Chamber was originally built in the second floor for use of the Senate. Since there has not been a Senate for several decades, this Chamber has no official function any more, and is used for party caucuses and other parliamentary or party functions on an ad hoc basis. Following the 4 October 2009 general elections, the Hellenic Parliament is composed of five parliamentary groups.